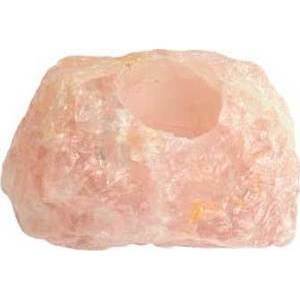 Corresponding with the West, the element of Water, and the planet Venus: Rose Quartz is associated with the heart, love, peace, romance, intimacy, and beauty as well as bond strengthening, protection from fears and nightmares, stress reduction, and fertility. Each of these naturally unique tealight holders are approximately 1 and 1/2 inches in diameter and crafted from a raw piece of Rose Quartz with a craved opening to place any size candle that fits within. The natural crystal points and facets of these attractive crystals will encompass the candle at its base while the flame illuminates these amplifiers of light and energy.